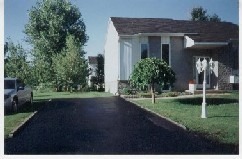 Your driveway or parking lot is a significant investment in your property. To beautify your establishment and protect your investment as long as possible, you want to protect your asphalt from the damaging effects of certain natural elements including moisture and ultraviolet oxidation. Natural and man-made elements can cause cracks half way into the asphalt, in as little as 5 years. Small cracks act as miniature storm drains after a good rain and cause raveling between the asphalt over time. If left untreated, these cracks grow over time and eventually allow water to penetrate to the base of the pavement. When this occurs, asphalt, like dirt, will simply erode. Unless precautions are taken, large cracks and potholes can appear withing the base as early as 8-10 years. Protecting asphalt with sealcoating basically has the same benefit as sun block has on your skin, or varnish on wood.